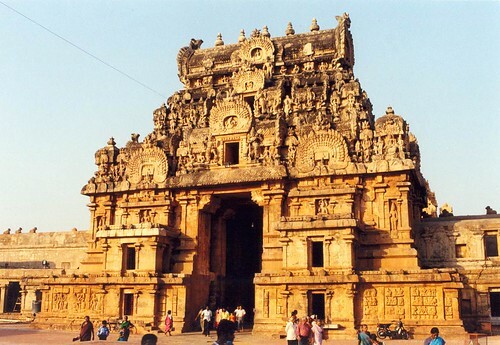 The Big temple of Thanjavur (earlier Tanjore) in Tamil Nadu, India known as the Brahadeeswara temple is one of the greatest masterpiece of not only the Cholas but also of the Indian architecture. 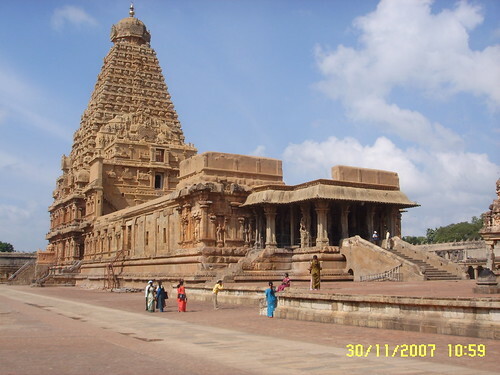 Dedicated to lord Shiva, it was built by Raja Raja Chola – I, from 1003-1010 AD and is entirely made of hard granite stone, a material sparsely available currently in Thanjavur area where the temple is located. The 13 storey temple tower is about 66 metres high and is shaped like a pyramid with square base of about 25 metres x 25 metres. The design of temple is such that shadow of the tower never falls on the ground and because of the carvings, the shadows on the sloping walls are also not easily discernible to the spectators at the ground level. This gives the temple an aura of awe and mystery. The Cupola or the bulbous structure on the top of the temple has been carved out from a single monolithic granite about 7.5 x 7.5 metres square, weighing about 81 tons. Its installation at the top is an engineering marvel. It has been estimated that a six kilometre long ramp must have been used to carry it to the top. The temple and the its entrance gates and other structures in the complex have beautiful stone carvings on the walls and insides. The temple roofs have some beautiful murals. It is listed in UNESCO World Heritage Site. 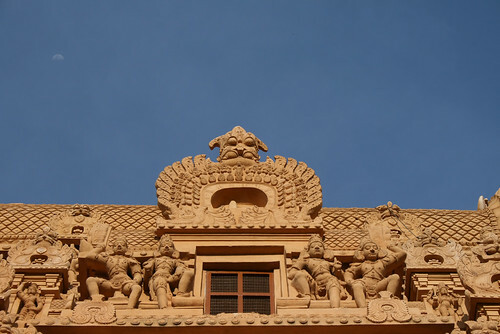 Here are some images of the temple complex. To fully appreciate the beauty of the carvings, it is suggested that the images be viewed in their largest size, which can be selected after clicking on the link given below each image. Image from Flickr is by Alagu. 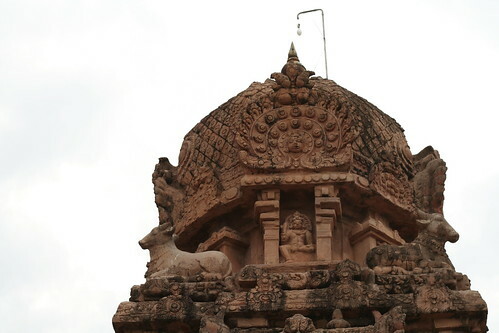 The temple complex also houses India's second largest Nandi (the bull which Shiva rides) statue. Credits: Sudarshan of Ahmedabad who brought the unique no-shadow feature of this temple to my knowledge - Thank you Sudarshan.